Which sauerkraut do you like best? I did a taste test between my favorite local, raw sauerkrauts (what is the point of cooked sauerkraut, I ask you? ), and it wasn’t easy to pick a favorite. 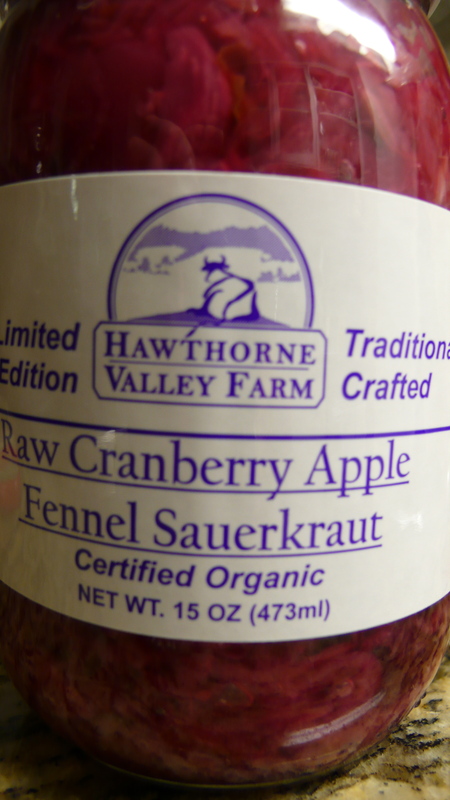 Hawthorne Valley Farm’s Raw Caraway Sauerkraut has been a favorite of mine for years. It is lacto-fermented, unpasteurized and raw and the ingredients are New York State Organic Cabbage, Unrefined Sea Salt, Organic Caraway Seeds and Organic Juniper Berries. Recently, I purchased the sauerkraut (new item) at Dickson Farmstand, which was also delicious. There is no ingredient list or information on the package, other than the word “sauerkraut,” but when I purchased it, they told me it was raw. Solely from the taste, I don’t think there is much else in it other than cabbage, salt and maybe some good bacteria for fermentation. 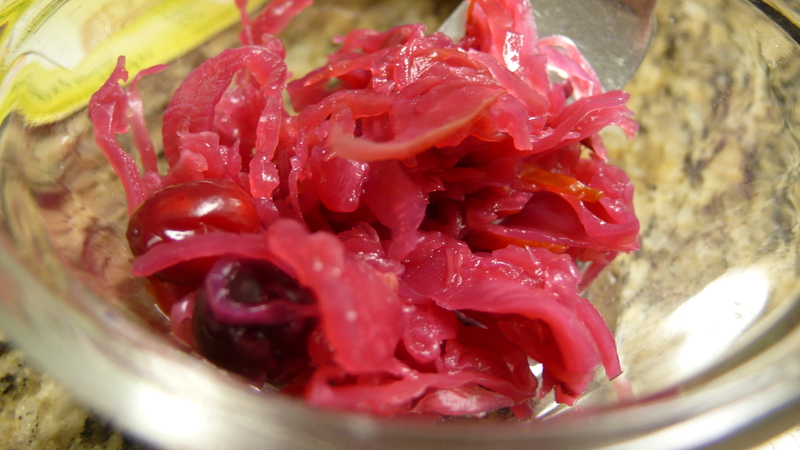 Not only is my favorite sauerkraut festive and beautiful, but Hawthorne’s Raw Cranberry Apple Fennel Sauerkraut mixes interesting flavors and textures. Check out that whole cranberry! Awesomely sour! I must give an honorable mention to Glaser Organic Farms Daikon, Ginger and Green Cabbage Raw Fermented Sauerkraut, which is what I eat when I’m in Florida. [Maybe it’s just me and my preternaturally heightened sense of safety-consciousness and general stain-avoiding tendencies, but I think it is a very bad idea to travel with fermented sauerkraut.] To my tastebuds, it is not tangy at all, nor is it very salty, but it tastes fresh and the ginger is strong. I recommend trying some if you’re looking for a good raw sauerkraut in Florida. This entry was posted on Sunday, March 13th, 2011 at 9:33 pm and is filed under Food and Drink. You can follow any responses to this entry through the RSS 2.0 feed. You can leave a response, or trackback from your own site. 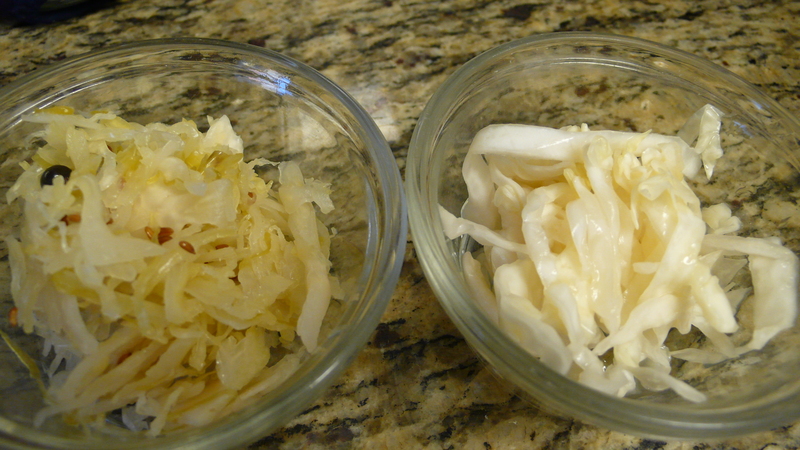 4 Responses to Which sauerkraut do you like best? where may I find the fave kraut? Good question. First and foremost, you can try it if we have a playdate at our house. Want to get the kids together at our place this week? Though Whole Foods sells Hawthorne Valley Farm Sauerkrauts, they may not carry the limited editions. Hawthorne Valley Farm is at the Union Square Farmer’s Market on Wed and Sat, so you could buy it there, as long as they have it in stock. I think I would like to do both… play date and then go find it at the market. May we say tomorrow tomorrow or next wed?